Product information "Glutathione Assay Kit"
Cayman's GSH assay kit utilizes a carefully optimized enzymatic recycling method, using glutathione reductase for the quantification of GSH. The sulfhydryl group of GSH reacts with DTNB (5,5'-dithio-bis-2-nitrobenzoic acid, Ellman's reagent) and produces a yellow colored 5-thio-2-nitrobenzoic acid (TNB). The mixed disulfide, GSTNB (between GSH and TNB) that is concomitantly produced, is reduced by glutathione reductase to recycle the GSH and produce more TNB. The rate of TNB production is directly proportional to this recycling reaction which in turn is directly proportional to the concentration of GSH in the sample. Measurement of the absorbance of TNB at 405 or 412 nm provides an accurate estimation of GSH in the sample. GSH is easily oxidized to the disulfide dimer GSSG. Because of the use of glutathione reductase in the Cayman GSH assay kit, both GSH and GSSG are measured and the assay reflects total glutathione. The kit can also be used to measure only GSSG by following an alternative protocol. 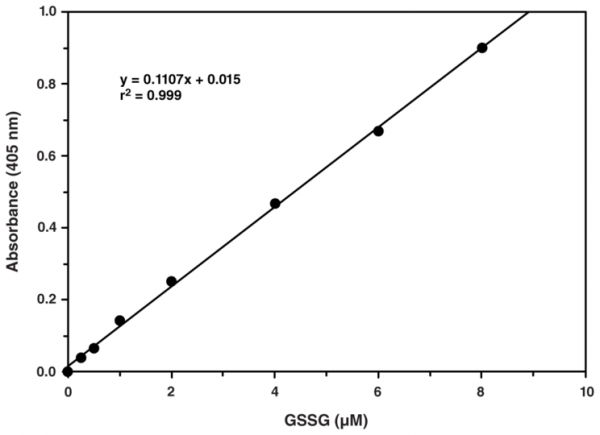 GSH measurement can be done in plasma, tissue samples, and cultured cells using this kit. Nearly all samples require deproteination before assay. Customer review for "Glutathione Assay Kit"